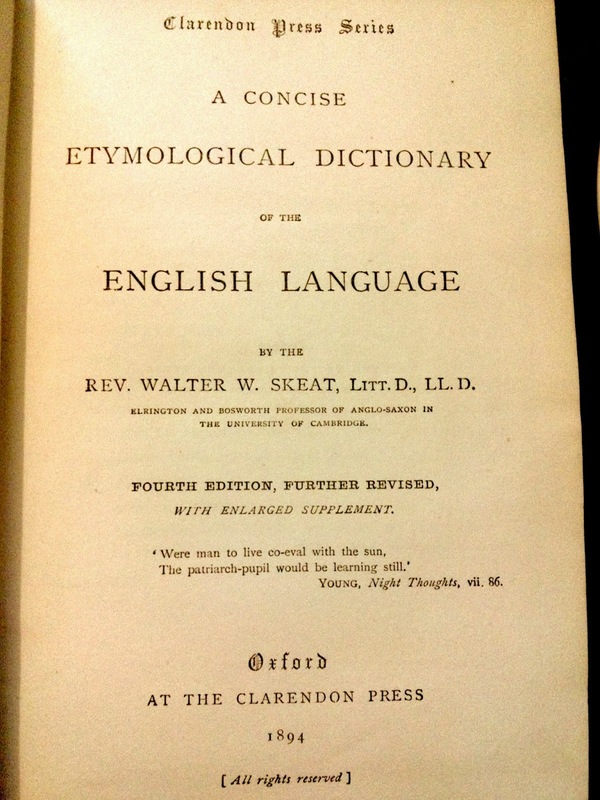 This week's dictionary is the fourth edition of the Concise Etymological as compiled by the Reverend Walter Skeat, 1894. The copy I own has a pasted in book plate, so I know that in March 1932 this book belonged to Mary Finney.  The cover has some rodent damage and the pages bear some discoloration; overall it is finely made and the paper superbly silky. It strikes me as incongruous that the first word I jab (eyes closed, that's the game) is 'frill, a ruffle on a shirt.' I was expecting something less decorative, something strict, a fastidious, perhaps, or a firmament? 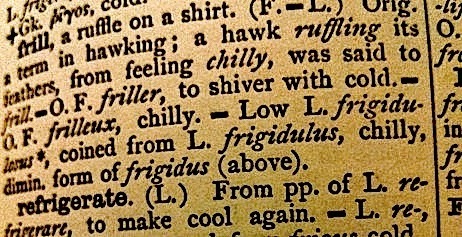 Yet this word has a history that traces back through Low Latin, frigidulosus; from the Latin frigidus; cold; and frigere; to be cold; leaks through to Old French (sourced from the dictionaries of Roquefort) friller; to shiver with cold; and settles as part of the English collection via the practice of hawking. A hawk ruffles its neck feathers for warmth: a chilly hawk was said to frill. Visions of a hunter; bird talons curled into the thick leather of a glove; snow flurries, ice sharp wind: Roquefort at his desk, lamp-lit, laborious at study: Latin: the grand root of all the Romance languages, spread over conquered kingdoms, consolidating form so as to be understood by this widening audience and simultaneously diluting, taking on vernacular; weaving and morphing: all language and life is in the flow. And can be represented in a ruffle on a shirt. Lisa, this made me tear up starting with my liver. 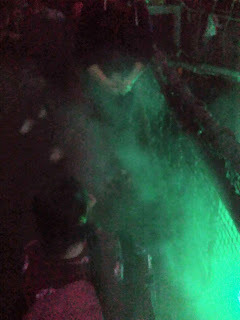 It is my honor to know you. Oh, the frill of it all. Fantastic summary...that last line. What an interesting history of the word frill...who knew it's origin was linked to cold. What a treasure your copy of the Etymological Dictionary. A useful lexicon! Our mainstay has always been Rand McNally's 1928 edition of Krapp's, "A Comprehensive Guide To Good English". 688 pages of pure Krapp, but my eldest is now an editor and writer and all the kids have published in their fields. I say keep those dusty dilapidated bug-bitten books. Remember the Eloi!